Categories: WASH Blank Forms and WASH Guidelines. Tags: Bathing Facilities, Boreholes, Bulk Water Treatment, Child Friendly Facilities, Communal Toilets, Communicable Disease Control, Communicable Disease Control, Community Led Total Sanitation (CLTS), Cross Cutting, Desludging and Excreta Transportation, Disability, Disease Vector Control, Drainage, Drilling, Excreta / Urine ReUse, Excreta Composting, Excreta Management, Excreta Management, Excreta Treatment, Gender, Grey Water Disposal, Hand Dug Wells, Handpumps, Handwashing with Soap, Handwashing with Soap, Household Toilets, Household Water Treatment, Human Right to Water / Sanitation, Hygiene Behaviour Change, Hygiene Promotion, Hygiene Promotion, Landfill Management, Laundering Facilities, Malaria, Medical Waste Management, Menstruation Hygiene Management, Piped Water Networks, Protection, Public Health, Public Health, Rainwater Harvesting, Sewerage and Excreta Conveyance, Solid Waste Management, Spring Protection, WASH Assessments, WASH Coordination, WASH Monitoring, WASH Programme Health and Safety, WASH Programme Management, Waste Recycling , Reuse and Reduction, Water Prospection and Investigation, Water Pumping, Water Quality Testing and Surveillance, Water Safety Plans, Water Storage, Water Supply, Water Supply, Water Tankering, Watery Diarrhoea, and Watery Diarrhoea. Languages: English and English. 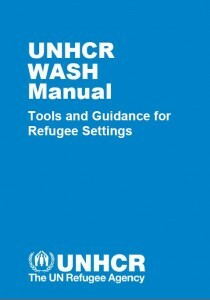 Organisations: UNHCR and UNHCR. 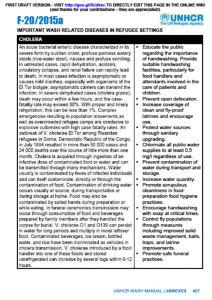 Categories: WASH Reference Documents and WASH Reference Documents.